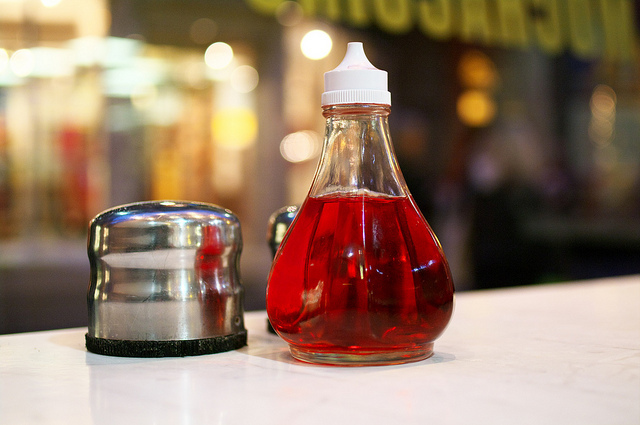 There is a bottle of vinegar in every kitchen. Apart from using it for cooking, you can employ it in your daily cleaning routines and finally get rid of the expensive and toxic cleaning agents that are being sold on the market. The acidity of vinegar makes it the perfect cleaning and cosmetic agent and can even be used for treating hiccups, dandruff and warts. Given its versatility, vinegar can replace a number of household items. Unclog drains. Pour 1/2 cup of baking soda followed by 2 cups of boiling vinegar. Follow that by hot water from your faucet for about 30 seconds. Remove mold. Spray moldy areas with vinegar, let it sit for a few minutes, then wipe it off with a rag and rinse. Let your windows shine. Mix one cup of water with 4 soup spoons of vinegar and spray on the window. Wipe with a newspaper - you will get immaculately clean windows! Clean food-stained dishes. Soak them in a mixture of water and vinegar for half an hour. Rinse and wash with hot water and dish soap. Eliminate odors and stains. Leave a bowl of vinegar in the area the smell is coming from, or clean the stained area with white vinegar. In a few hours the smell will be gone. Disinfect your dishwasher. Run the dishwasher empty after pouring 1/2 of a cup of vinegar in the soap dispenser. Remove a sticky label. We've all had trouble with stickers that leave half of their glue and paper on. Soak the sticker in vinegar for half a while and it should come off easily. Clean brass and copper. Make a light paste of vinegar and table salt, which you can use to clean brass and copper with. Clean up candle wax. If there is candle wax onto your wood table, use a blow dryer and vinegar to remove it. Heat up the wax with a blow dryer and use a paper towel to dab up as much of the hot wax as you can. Then, with a cloth soaked in equal parts water and vinegar, wipe up the remaining wax. Remove wrinkles. Spray your wrinkled clothes with 1:3 ratio of vinegar to water and hang them to dry. Clean your eye glasses. Vinegar can easily cut through oil-based stains. Place a drop of vinegar each to the lenses of your glasses. Wipe the stains away with an eyeglass cleaner. Use it as conditioner. Dilute a soup spoon of vinegar in a glass of water and apply to your washed hair. It will make it soft and shiny. Fight acne. Vinegar not only clears up a breakout, it can even reduce acne scarring. And it’s great for lightening age spots or other discoloration. Treat sunburn. Rub a small amount of vinegar on the sunburnt areas. The redness will slightly fade, and so will the itching. Ant repellent. Last spring we were attacked by ants, so we tried everything. A possible solution is putting vinegar on your walls and corridors. Ants, for some reason, do not like the scent of vinegar. Do you know a particularly good use for vinegar that I haven't mentioned? Do tell us in the comments! Sources: How to Reuse it Creatively, Lifehackery. That's a great list. Similar to using vinegar as hair conditioner, I use it for fabric conditioner, with a capful of eucalyptus oil. Worth noting that it may be better to use white vinegar for cleaning, to avoid staining. Yes, very useful advice! I will try using it as a fabric softener. Pay attention to black colors and elastics with vinegar in your washing machine. This is fantastic Sonya! With vinegar and baking soda we reallly don't need anything else in the house! I am going to try all of these! I'm a convert to Apple Cider Vinegar as a hair conditioner. After switching to a combo shampoo/conditioner bar soap my hair was sticky and didn't feel clean at all (even though I know it was). Adding a vinegar and water rince afterwards made all the difference in the world, and didn't smell like I thought it would! I too love using vinegar as a conditioner but I am yet to try a shampoo bar. So far I've spent a year without shampoo! I almost skipped reading this post since I thought I had read all the vinegar tips before, but there are several here that are new to me. Ant repellent? Acne treatment? I had no idea. I also use vinegar in the rinse dispenser of my dishwasher instead of the commercial (and toxic) stuff. A mix of 1/4 vinegar, 3/4 water, a drop or two of soap and a few drops of lemongrass essential oil is also my go-to all-purpose cleaning spray as well. Years ago I read that applying vinegar to misquito (spelling?) bites makes them much less itchy. We've been doing that for years and it really works! Just tab it on with a cotton ball or even your fingers. Yes, how could I forget! Ever since I was a kid we've used the vinegar method to relieve mosquito bites, thank you for your idea! I love the acne thing :) very useful! Thanks for the information. I knew most of them but like everyone else the one about ants is very interesting. We have had lots of them this year so I may have to try that one for sure. Oh, talk to me about ants. It is still not their season around here but I am prepared this year, haha. Dude! I've been SO excited to recently find out how great vinegar is for cleaning the little kid toilet pot. When the kids forget to empty it and I do, too, there are deposits that form. Instead of using harsh, smelly chemical cleaners- I totally cover the deposits with vinegar and let it sit for 20-30 min. Then, just wipe! No scrubbing needed!! This is great, thanks for sharing your tip, Sarah! Do you mean plastic pot? That list is very helpful! I learned a few new ideas. Thanks for sharing. Thank you for your input, Melissa! How often should the mixture be taken?